Around 10:10 AM on Sunday July 17th, a pipeline leaked propylene in the community of Baytown, TX, near the ExxonMobil Baytown refinery. Propylene is a dense, colorless gas that is considered non-toxic but flammable. The pipeline leak highlights some of the challenges associated with emergency response along within the Houston region. At 10:30 AM, according to the Houston Chronicle, three houses were evacuated and all others within the vicinity of the leak were told to shelter in place. The emergency response was mixed. Residents who signed up for city notifications through Baytown Alert were apparently notified by phone and by email around 10:30 AM about the order to shelter-in-place. Yet some confusion remained – who exactly did the shelter-in-place include? What had happened, and what kind of chemical was released – something flammable or something toxic? Should residents downwind be concerned? The CAER line, which is supported by the East Harris County Manufacturers Association, provides a hotline for Harris County residents to call to obtain more information regarding emergency situations. During the incident on Sunday, several people known to us called CAER to hear the messages it posted regarding the situation. It is unclear how quickly the first message regarding the incident was posted to CAER; a Baytown resident stated that it took about an hour following the incident before CAER posted a message. On Sunday at 1:05 PM, there were no current messages, even though the shelter-in-place had not yet been lifted. At 2:30 PM, CAER’s message stated that a propylene leaked resulted in the shelter-in-place warning. The City of Baytown reported via twitter that the shelter-in-place had been lifted at 2:38 PM. At 3:30 PM, CAER’s message line mentioned the leak without any mention of a shelter-in-place. Around 4:20 PM there were no current messages on the CAER line. Although the City of Baytown notified residents of the shelter-in-place, the residents we spoke with never received the all clear and were not informed when the shelter-in-place had been lifted either via siren or via email and phone. In fact, it is unclear if sirens were used to communicate the shelter-in-place, which is an important way to inform people who may be visiting the area or who may not have access to other technology. Many questions remain unanswered and the Healthy Ports Community Coalition (HPCC) is actively researching to fully understand the emergency response. The HPCC is also proposing a system like an amber alert system to make use of our modern technology so that residents can be informed immediately when emergency evacuations or a shelter-in-place is called for, notified when it is all clear to return to normal, and they can be instructed specifically on what steps to take to keep themselves and their families safe and healthy. 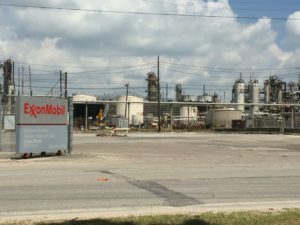 In this case, Baytown residents were lucky that the chemical leaked was not deemed toxic and that no one suffered any known health impacts from the leak. HPCC is working to keep residents safe and informed for when the next incident happens. The Healthy Port Communities Coalition is growing a strong base of well-informed and active local residents who engage public and private stakeholders directly on priority issues including jobs, pollution, health, neighborhood safety, and economic opportunities.